However that changed in the summer of 2009 when I took my family on a fly-drive holiday in the USA. Whilst researching possible photographic locations for our trip I came across a picture of False Kiva by the photographer Stephen Oachs. His is entitled “The Tribunal” and to be quite honest I was simply blown away, not just by his stunning photograph, but by his capture of such a breathtaking location. I decided that this False Kiva was a place just too good to miss. 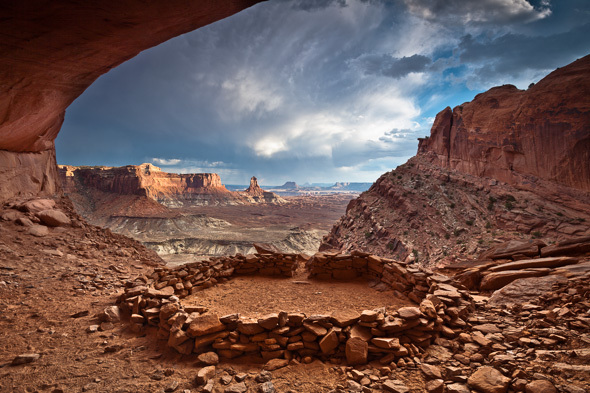 It is however, the photograph “Ruin in a Cave” by celebrated Moab based photographer Tom Till, that brought notoriety to the False Kiva location more than any other photograph, so if you get to Moab don’t forget to visit his gallery and see his version first hand too. I soon found out that False Kiva is not the easiest place to find. It’s situated in the Island In The Sky section of Canyonlands National Park, about 35 miles from the town of Moab. False Kiva is a category II listed archaeological site and as such is not marked on any maps or guides, nor will you find any signs for the trail. In fact False Kiva is almost a secret location. I was left in no doubt that she didn’t approve of me visiting the False Kiva site, especially when I mentioned photography! However, if you ask about the site at the park visitor centre the rangers are obliged to give you directions to False Kiva. In my case a young female ranger presented me with a single page summary in a folder for a few minutes and I wasn’t allowed to take notes. She didn’t say directly but I was left in no doubt that she didn’t approve of me visiting the False Kiva site, especially when I mentioned photography. I was also requested not to divulge the False Kiva whereabouts to any other people. The details of how to get to False Kiva presented by the Ranger were sketchy to say the least. Had I been familiar with the park and the terrain it may have meant more, but I was not, so I knew I wouldn’t be able to recall enough of the details to get me there. I left the visitor centre with the distinct feeling that the general public are totally discouraged from visiting this site. There is perhaps, good reason for the rangers attitude, as many of the archaeological sites over recent years have been vandalised and treated with disrespect, and this has happened to the False Kiva site too. I was not one of those people however, and can’t abide nor comprehend what causes any person to commit such an act. It seems photographers around these parts don’t always have a good name. The following day I made an early morning trip to Mesa Arch to photograph the sunrise and had the good fortune to meet two fellow photographers, Jim and Tom. After the glorious red glow beneath the arch had faded our conversation turned to other locations and photography in general. I brought up the subject of False Kiva. Lucky for me (and Jim too), Tom turned out to be a Canyonlands regular and had visited the False Kiva site on several occasions. Jim and I were keen to go, and Tom kindly agreed to take us. We agreed to meet at 5pm later that day and hike out to try and catch the late afternoon sun. You may be wondering why this location is called False Kiva. A kiva is a room used by Puebloan Indians, thought to be used for spiritual ceremonies and communal purposes. Many kivas comprise circular rooms which are often sunken into the ground, bearing a thatch roofs with a central opening and ladder for entry. The ruin at False Kiva simply comprises a low circular wall, so it is not know whether this was a true kiva or not. The path to False Kiva commences just before the trail head to Aztec Butte on the road to Upheaval Dome and we all met up near the parking spot by the side of the road. The trail heads out across the mesa top and gradually descends over a dry waterfall and down a boulder and scree section which takes you well down below the mesa top where eventually it levels out and crosses directly below False Kiva, before ascending into the alcove from the far side. It’s a bit of a scramble and you need to watch your footing, especially when loaded with photographic gear, but it’s not as difficult as some web sites make out. Just take care and plenty of water if you go when it’s hot. It probably took us the best part of an hour from the road. When you arrive in the alcove the view (to coin an American phrase) is truly awesome. False Kiva is set in a huge half dome shape alcove set back into the mesa cliff face with stupendous views over the green river canyon and candlestick butte in the distance. You can see for over 50 miles. The stone circle is set in central position toward the front and there’s plenty of room for tripods behind. There’s an eerie cathedral like silence and presence within the alcove and you can see why the Pueploans thought this a spiritual place. It is indeed a very special place. The afternoon storms had arrived during our hike and now the skies were dull, grey and full of cloud, and the canyon below overcast and devoid of contrast. Still, one could help shooting off several frames no matter what the weather. We chatted and waited and hoped for break in the weather, but still the clouds persisted. The company was good, lots of banter, both photographic and other topics, and time past. False Kiva is a truly awesome place and it felt good to be there. Then just when we were beginning to discuss leaving, the clouds abated to the north and shafts of olden sunlight lit the canyon floor and walls and our camera shutters snapped to and fro. Dramatic stormy skies, and sun, all we could have hope for. Don’t be put off visiting False Kiva by other parties, it’s well worth the effort, but do respect the nature of the site, don’t disturb anything and leave only footprints. Eventually the sun light faded and soon it would be getting dark. Time to pack up and head back. By now we could hear voices approaching as a party of 4 made their way across the scree. And guess who it was, no other than the young female ranger who had been so discouraging to me, and yet here she was bringing a party of her friends to the False Kiva site. Just a tad hypocritical don’t you think? We left leaving them in the alcove. The best light had long gone. After about 15 minutes walking, we observed the other party set off back too and to our surprise a couple of their members decided to try a short cut from the wrong side of the alcove down the steep boulders. Very ill advised. We turned out of sight as they struggled with their poor decision. False Kiva is a fabulous photographic location and for me was the highlight of my US trip without doubt. Don’t be put off visiting False Kiva by other parties, it’s well worth the effort, but do respect the nature of the site, don’t disturb anything and leave only footprints. The False Kiva alcove is in shade in the afternoon. If the sun is bright there will be high contrast between the dark alcove, the sky and canyon floor. I found I needed to use ND grads to compensate. I tried from 2 to 5 stops (3+2), but settled on a 3 stop grad for most shots. Unfortunately this really darkens the roof at the right side alcove which appears in the frame, but is needed to hold back the sky (see Tom Till’s photo). I did try bracketing in the hope to try some HDR but the clouds were moving too fast and this rendered an unsatisfactory and unnatural looking sky. You’ll need a wide angle lens to shoot False Kiva. I used my Canon EF 16-35 mm F/2.8 and shot most frames between 18-22mm on a full frame Canon 5D Mark II. I brightened some of the dark areas with the adjustment brush in Lightroom, and adjusted clarity, vibrance, some minor chromatic aberration and added some sharpening. Around False kiva these are almost too numerous to mention. Mesa Arch, Green River Overlook, Deadhorse Point to mention but a few. Don’t forget Arches National Park too. I stumbled upon this blog about False Kiva the other day, that of a ranger who obviously detests photographers. Our visit to False Kiva occurred around the same time although she certainly wasn’t the ranger I talked to at the visitor centre that day and we certainly didn’t stand within the Kiva circle. Maybe Tom or Jim can recall if she was one of the party. Not all rangers are like this however. On the whole I found them to be well informed, courteous and extremely helpful. Kicking over cairns seems a somewhat drastic, stupid and inordinately inane action to take as these provide guidance and safety for hikers. There is a trail to False Kiva there is no denying that, it’s just not well marked and if rangers can visit with their entourage then why not anyone else. No doubt this particular ranger would be quite happy if a photographer got lost and walked off the edge of the mesa. What a hypocrite! And last but not least, a big thanks to Jim and Tom for such good company on what was an extremely enjoyable late afternoon. We visited the site in the mid 1990’s during the early summer. I believe there were less than a dozen people camping in the park that week. what I remember mostly about the cave besides the view was how cool it was inside and it wasn’t very deep either. Anyway several years later during a canoe trip down the Green we visited Tom Till’s gallery and saw ‘Ruin in a Cave’ and thought that looks very familiar. Anyway ended up purchasing no 3/350 and still enjoy looking at that fine piece of photography.